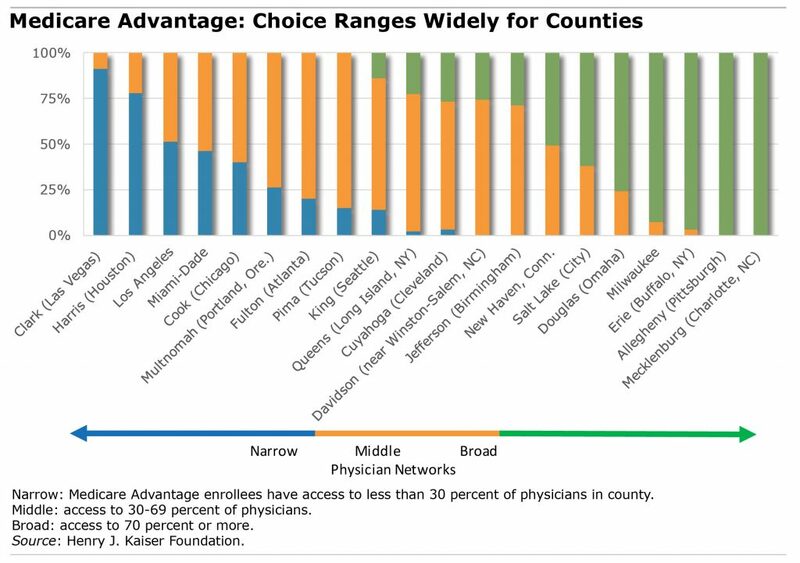 There is wide variation, from county to county, in the breadth of the physician networks. For example, most of the retirees in Advantage plans in Clark County (surrounding Las Vegas) and in Harris County (Houston) are enrolled in narrow networks. These counties contrast sharply with plans offered in Erie (Buffalo, NY), Allegheny (Pittsburgh), and Mecklenburg (Charlotte, NC), which included virtually all the physicians in their local areas. 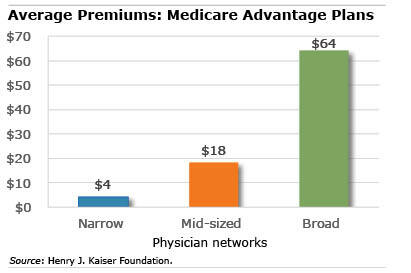 Premiums averaged $4 per month among the counties with narrow networks, compared with $64 per month where broad networks prevailed. Medicare shoppers should keep in mind that Kaiser’s sorting of counties into narrow, mid-sized, and broad physician networks isn’t a definitive indication of the availability of physicians either, because some counties with narrow networks, like Los Angeles, have large numbers of physicians in their plans simply because they are very large counties. Further, even plans with large numbers of physicians may have much narrower networks of specialists. For example, Neuman said, 16 percent of the plans in Kaiser’s study used fewer than five radiation oncologists. This may not matter to healthy seniors shopping for a plan during the Oct. 15 through Dec. 7 open enrollment period but could become critical to those diagnosed with cancer. The study also supported what many retirees already know: finding a specific set of doctors, especially in plans with narrow physician networks, can be extremely challenging. When the process frustrates retirees, they often take the easy route and stay with the same plan year after year, which can be more expensive than reconsidering the options every year. Determining which doctors are in which plans isn’t easy either, in part because the Plan Finder on Medicare.gov does not list the physicians in each plan on offer during open enrollment period. To find doctors requires leaving Medicare’s website and searching through each insurer’s website for the plans under consideration. “There’s no place where a consumer can ask which plans in my area include this particular doctor,” Neuman said. And nearly half of the entries in physician directories contained inaccuracies, a study by the Centers for Medicare and Medicaid found earlier this year. Advantage shoppers should take care. What we are seeing the Baltimore-Washington market is a bit different. Here, several Advantage plans are organized around hospitals and health delivery organizations and their affiliated providers. These include MedStar Health (Georgetown Univ. Hospital), Johns Hopkins Medicare and the Univ. of MD Health Advantage program. These plans seek to get everyone’s interests in alignment, where they are the plan, the network, the hospitals and are their own insurance company. Provider payments can be based on meeting certain metrics within their practices, as well as the plan meeting overall targets with incentives toward quality of care and not simply performing more services. MedStar is shrinking it’s service area this year as Hopkins and U. of MD are expanding. I would like to see Medicare step up and incorporate functional medicine doctors, chiropractic, and massage therapy into their programs — let’s start healing the causes and the “why” people are sick and stop treating symptoms by going to “specialists” where one doctor does not treat the whole person/body. Those specialists never talk to each other and we have a world filled with misdiagnosed and over prescribed human beings. A lot of these hospitals and doctors are surviving off kickbacks from pharmaceutical companies — a pill for your ill. I know too many people who are handed any type of medicine they “think” they need. It’s a messed up system indeed.